Hello, everyone! I’m back with review and translation again. This time, I’ll review Shin Domoto Kyoudai (again). This is the episode when Takamina becomes a regular in this show. I won’t translate the whole show. Just some of funny moments in this episode. The download link is in the end of this post. The show starts in the backstage (dressing room). There are the duo KinKi are recording for the opening in front of Takamizawa’s dressing room. Takamizawa: *comes out from his dressing room* Who the hell do you think an old man? Yay… I’m (still) healthy! Kouichi: Starting from today, we’ll have new members for regulars. We’ll barge into their dressing rooms one by one and do a sudden recording inside. And this kind of recording might be just once in the whole time; now. Tsuyoshi: An instruction is given to them to show their enthusiasm (to be a regular in the show) while impersonating. Maybe they’re waiting in their dressing room nervously now. Some of them have read the script yesterday so now they are preparing some tools for the impersonation. It will be embarrassing to put those kind of tools on, right? Kouichi: Well, if it’s me, I’ll put them on casually. Tsuyoshi: …please make this secret. The first one is Makki (Makihara Noriyuki). Tsuyoshi: The first one is this person. Let’s get inside. GOOD MORNING! Kouichi: We won’t knock the door first. Makki is dressing as a kappa. Tsuyoshi: Today we’d love to interview one by one of the new members of the show so please tell us your enthusiasm to the camera. Kouichi: I totally don’t understand what he said. It isn’t even counted as an enthusiasm words. Kouichi: Do you understand what he said? 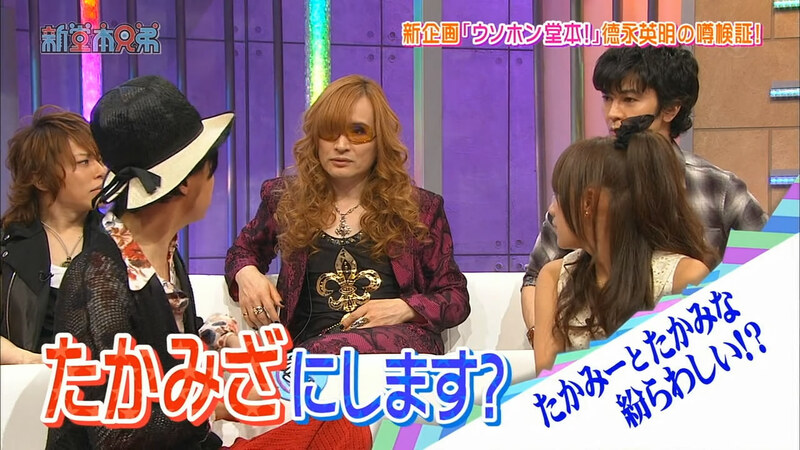 Tsuyoshi: To tell you the truth, I don’t understand at all either. 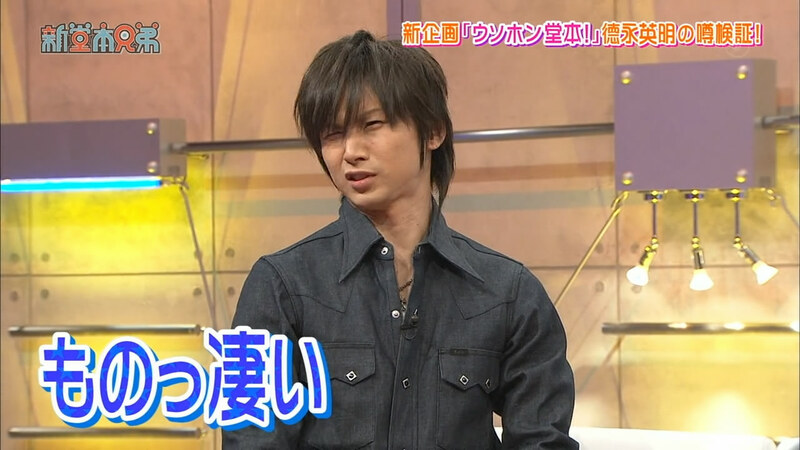 Makki: *points at Tsuyoshi* Kouichi-san is…umm…(born on) Jan, 1st, right? Kouichi: You pointed at the wrong person! 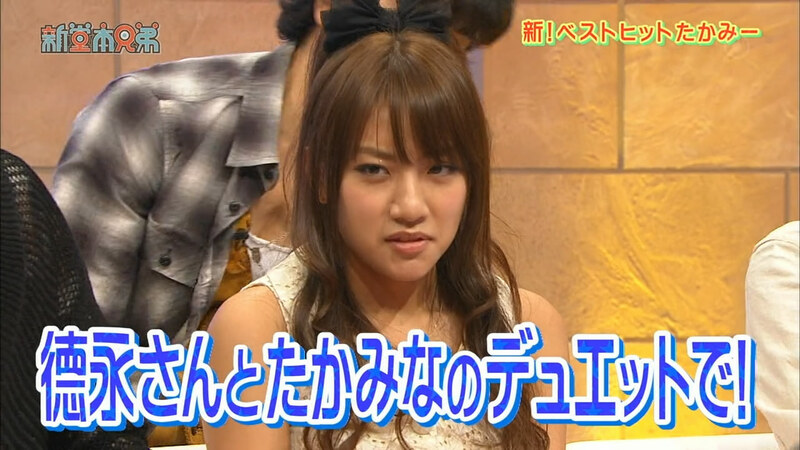 The next person’s dressing room to be barged is Takamina’s. 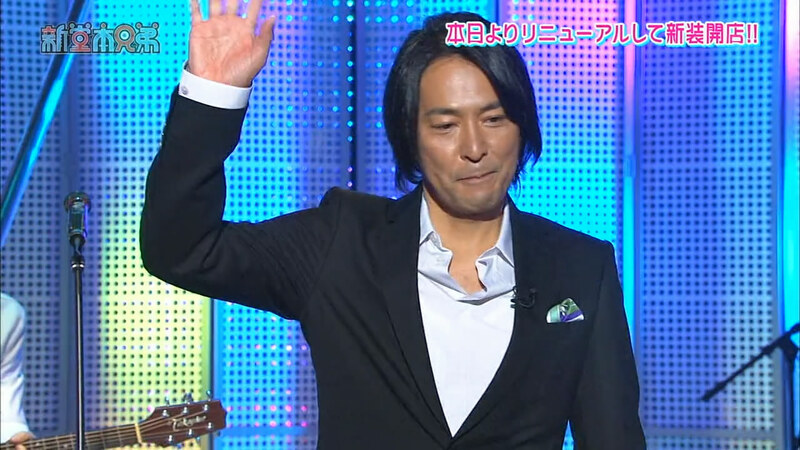 Tsuyoshi: Let’s go without further-ado. Takamina: *while impersonating someone* Hello. Good afternoon. Kouichi: I don’t have a single idea what is she doing now. Kouichi: *laughs* I got it! 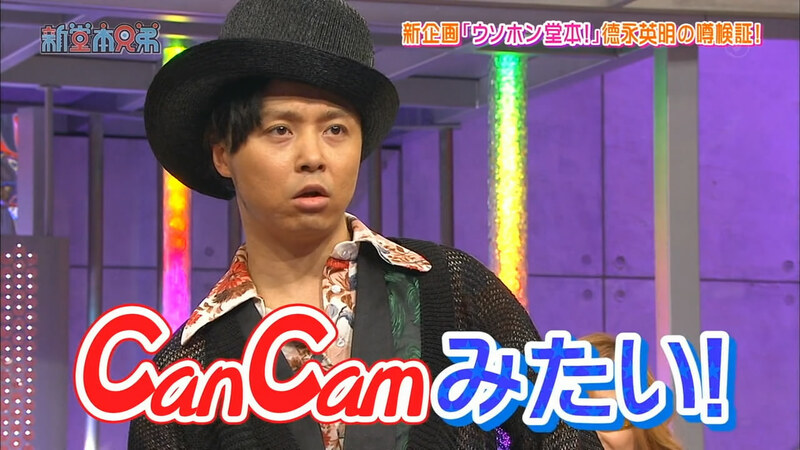 Tsuyoshi: You’re wearing a low quality (cap). Kouichi: Yeah, so low! Show us your enthusiasm. 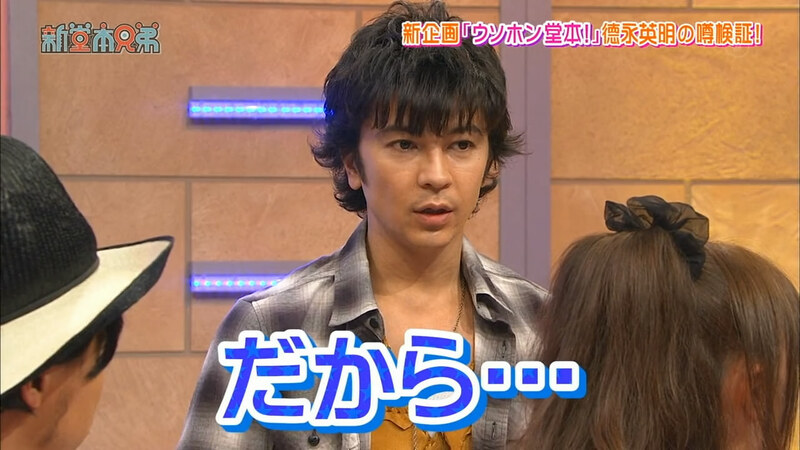 Tsuyoshi: That was good, righ? Kouichi: Yeah. You did your best. Takamina: Thank you very much. 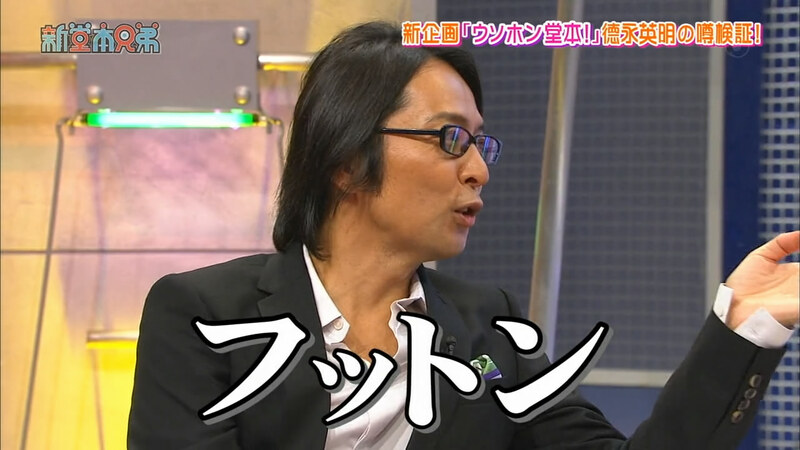 Tsuyoshi: The next person is a bit dangerous. He’s easily failed with his jokes. Let’s enter his room! The guest in this episode is Tokunaga Hideaki-san. 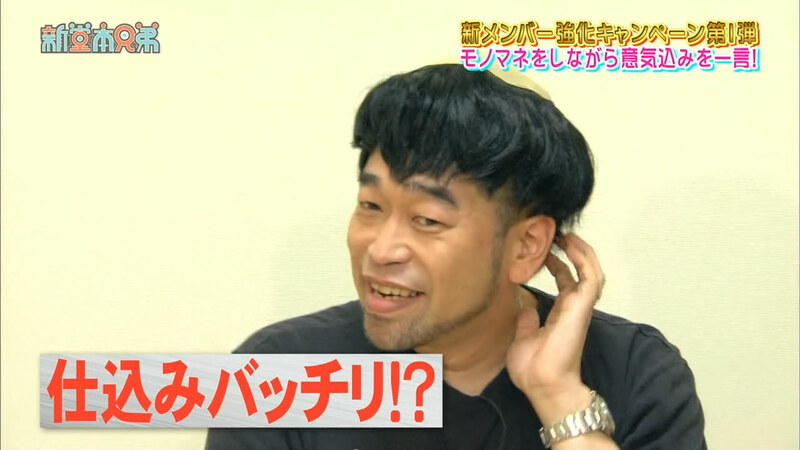 The show has renewal with its regular members and a new segment like “Truth or False Doumoto”. The narrator will tell the members about a fact of the guest. The members have to guess the fact; true or false. Narrator: Tokunaga-san had ever been selling Soumen in the past. True or false? Narrator: And the answer is? Tsuyoshi: A part time job? Tokunaga: Yes. When I was in high school, I worked at my friend’s house that was selling Soumen. I picked and delivered the customer’s orders. Tsuyoshi: You went door to door to sell it? 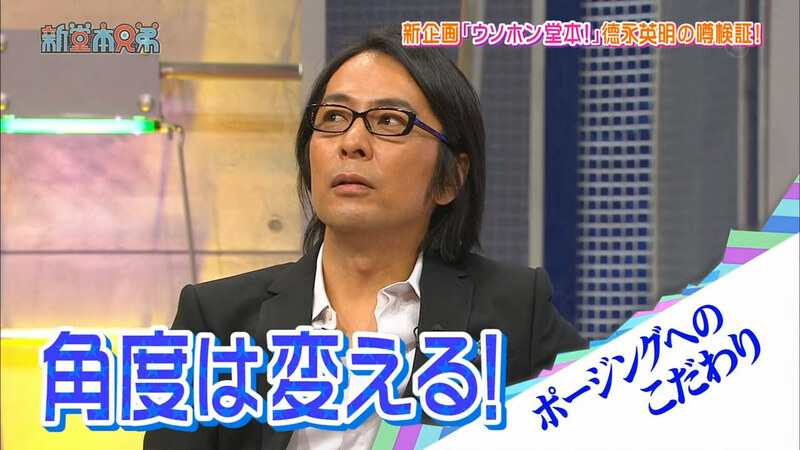 Tsuyoshi: For both of us (KinKi Kids) we don’t have any experience of doing part time jobs. Takamizawa: I had. I worked at a Futon shop. There was a shop in a department store named “Nishikawa Futon”. Takamizawa: I didn’t do that! Takamizawa: I also worked as a truck driver’s assistant. Tsuyoshi: What did you do? Takamizawa: I helped him to carry the loads together. Kouichi: Makihara-san, do you have any experience of part time job? Makki: Yes. My parents’ house was an electricity goodies store. Like installing AC. Makki: I brought it until the 5th floor of the apartment complex to do the service. Kouichi: How about you, Nishikawa-san? Nishikawa-san was working in an udon shop. And he told about how he creates the udon in a large hot pot. Kouichi: Takeda-kun, don’t you have any? Audience are laughing because of Takeda’s sudden silence. Takeda: I made a lot of mistakes. Tsuyoshi: That’s right. You were about to say something but you felt the words arrangement seems going to be wrong, right? Takeda: Yes. Thanks for confirming it. 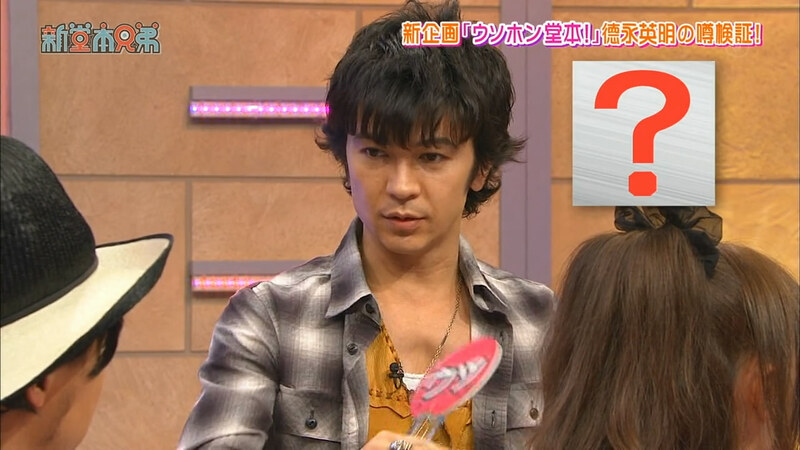 Tsuyoshi: Your eyes look quaking. Tsuyoshi: What do you want to convey? Takeda: We have new members here and what should we call with each other? Nishikawa: But Tokunaga-san is here too! It’s not like he’s going to be always here from now on. Kouichi: The guest is completely left behind. Tsuyoshi: Yeah, yeah. I can feel that too! Takeda: (to Tsuyoshi) You thought that just now too, right? Kouichi: But Takamizawa-san is Takamizawa-san. 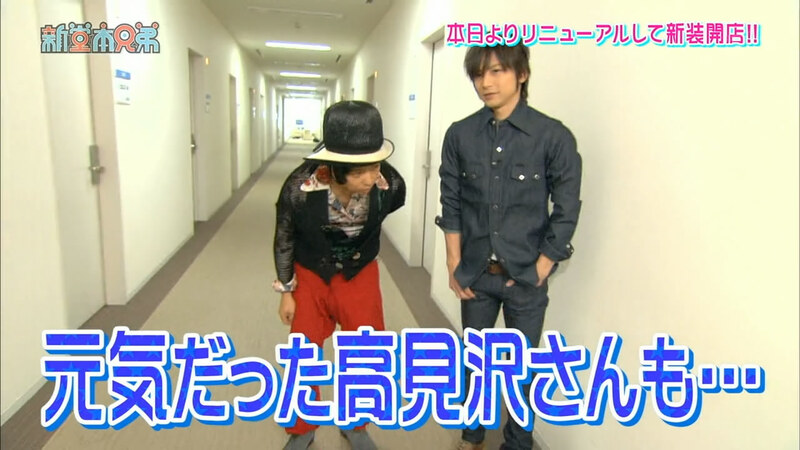 Tsuyoshi: Shall we make into “Takamiza”? Tokunaga: (to Nishikawa) Have you ever been called “Futton”? Nishikawa: Who? Me? Why “Futton”? Nishikawa: Was it because of the Futon Shop? Eh? Is it a joke description? Narrator: When Tokunaga-san was 8 month, he was pressing his hands together and praying in front of a picture of his grandfather and made the surrounding shocked in his grandfather’s funeral. True or false? Narrator: And the correct answer is? Kouichi: Does it still remain in your memories? Tokunaga: I don’t remember but my mother talks about that a lot. Takamina: What did you sing in that choir*? LOL! Look at that confused face! XD And everyone is laughing at her. Takeda: That’s a good one! Yeah! Takamina: It’s Tokunaga-san we’re talking about. And it is possible to him to attend a choir! Tokunaga: Attending a choir in 8 month is way too amazing, isn’t it? Kouichi: And it wouldn’t be just Tokunaga-san. There would be a lot of babies. Tsuyoshi: It’s like his 8 month pals are there. And they would sing and sit like this. Kouichi: When I was in shichi-go-san, I was being taken to a photographer… And I was forced to wear hakama too. And I had to walk to that photographer workplace while wearing that outfit is too embarrassing to me. Then the photographer took my photo. And I was making an unpleasant face in that photo. Since that time I started to hate photography. 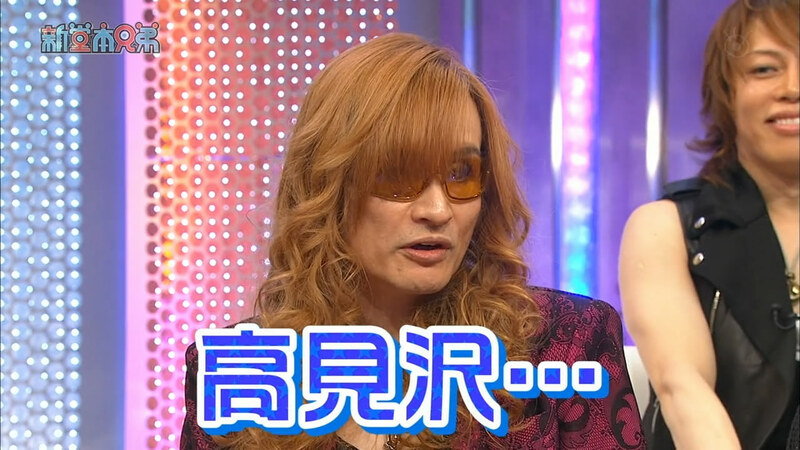 Tsuyoshi: I see… For example, AKB members are changing pose for every photo, right? Takamina: In the opposite, it’s so fun! Kouichi: Are you girls really doing that??! Tsuyoshi: Let me say this; I often do that too when I’m alone. Tsuyoshi: Come on, let’s try! Kouichi: WAIT! What do you think about this, Tokunaga-san? Are you making some poses too? Tokunaga: I do change some angles. Tsuyoshi: (to Kouichi) And you don’t change poses. Like Can Cam. Kouichi: We have a cameraman. Show me how to make some poses. Tsuyoshi, go take around 5 shots. Please do. 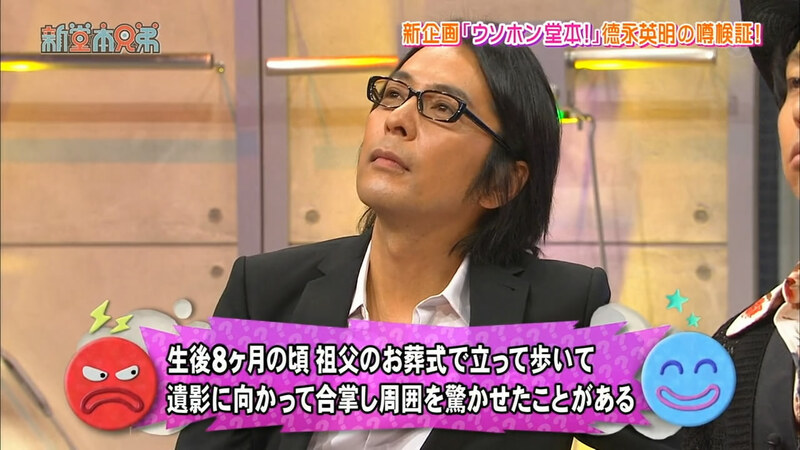 Tsuyoshi: It helps the photographer to choose which good photos are. Kouichi: (to the photographer) Did you take a good one? Kouichi: Can you do it too? Takamina: Is his expression not changing? Eh? He doesn’t change his expression! Takamizawa: We don’t know if the photo is taken or not! Tsuyoshi: Okay. Next is KinKi Kids’ turn. Tsuyoshi joins with Kouichi in the photo session. 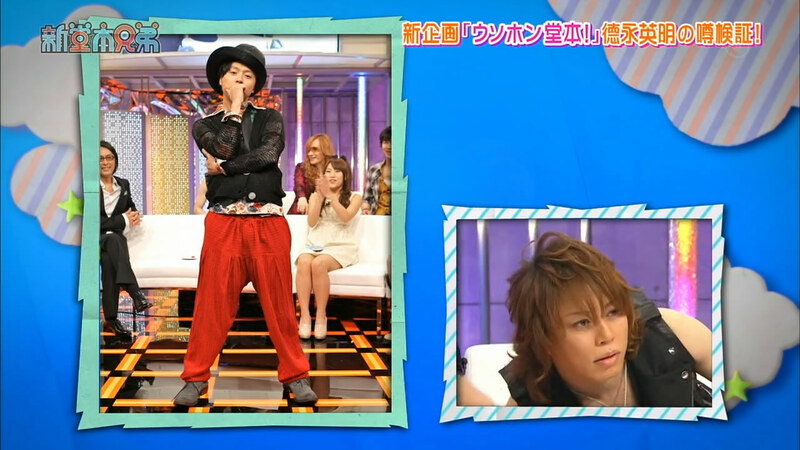 Tsuyoshi made some poses while Kouichi didn’t at all! Takamina: Kouichi-san, are you a mannequin? Kouichi: Takamina, show us what you’ve got! Takamina: I have confidence in this! Kouichi: I’ll study from you. Takamina: Of course I’ll do some Idol poses. Kouichi: Eeeeeh? Like that? Oh, no! It’s embarrassing! Kouichi: (to the photographer) Who do you think is the most interesting? The next segment is about “Tokunaga-san got a heartthrob moment when he saw cheerleaders in a high school baseball tournament in spring”. That statement is false. The one who made his heart throbbing was green turtle. Kouichi: I saw Takamizawa-san when he was pointing out his sign. He was putting too much energy when pointing. And Kouichi noticed that. Kouichi: Were you thinking that it’s true if it was you? Takamizawa: (to Tsuyoshi) Don’t you think so? Tsuyoshi: Wow. He threw it to me. Kouichi: But you know, when we were teen, we are already in the entertainment industry. We had never been walking together with a girl in school uniform. Kouichi: How about you, Takamina? 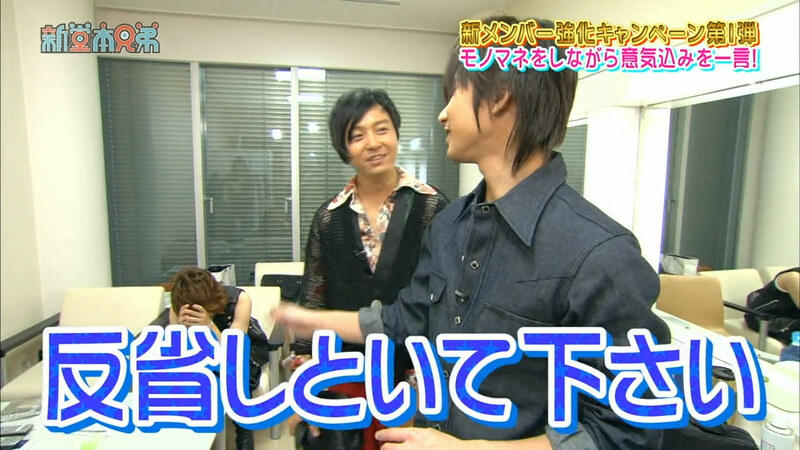 Tsuyoshi: “I’m here working already!” like that? Takamina: Yes. I was thinking like that. Kouichi: Were you in Yutori education era? Takamizawa: …Takamizawa—Oh, wait that’s wrong. 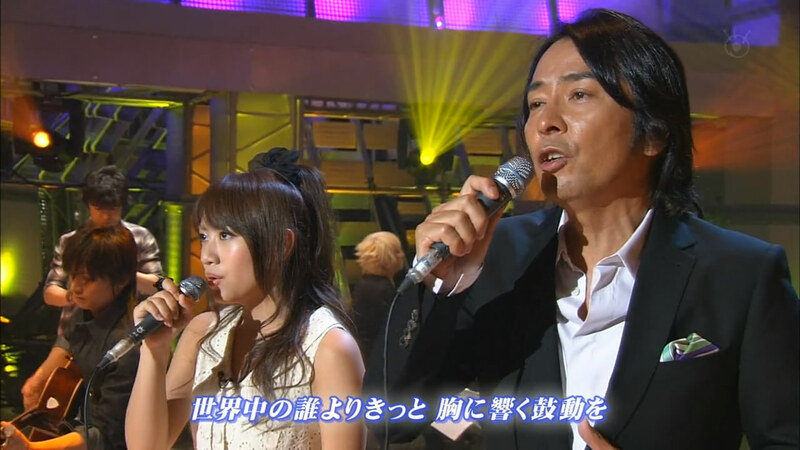 Tokunaga-san would sing a song from Nakayama Miho-san’s “Sekai-juu no Dare Yori Kitto”. 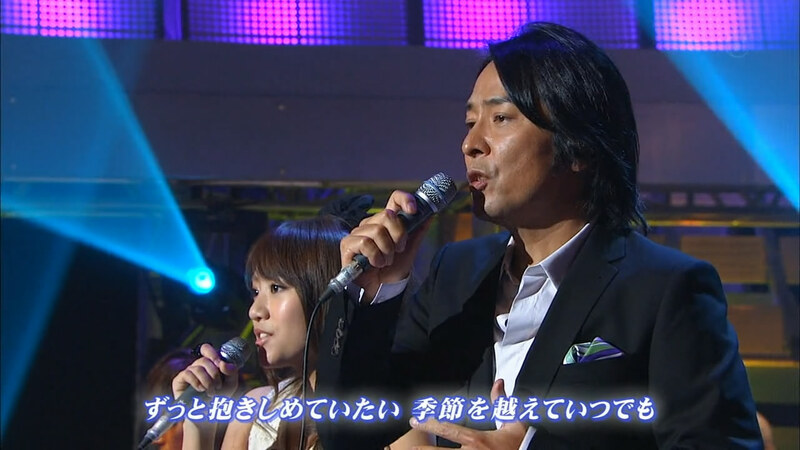 And he’s collaborating with Takamina. Takamizawa: This song will be a duet for Tokunaga-san and Takamina tonight. Kouichi: You’re very nervous, right? Takamina: This is bad… This is bad… The truth is, when I was trying to focus in the talk segment, I couldn’t hear about the “Futton” talk properly just now. Kouichi: It can’t be helped! 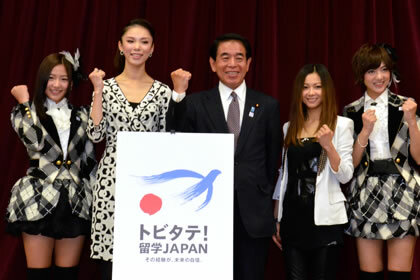 Monbukagakusho held an event entitled “Tobitate! Ryūgaku JAPAN” on October, 29th 2013. I found an article about the report of that event. Nakagawa Haruka (JKT48) and Miyazawa Sae (SNH48) became the representative in the event along with Mori Riyo (Miss Universe 2007) and Kuraki Mai. Here is a little translation of the report. Minister: I saw you in Indonesian TV CMs a lot and you’re very popular. But I heard you can’t speak Bahasa at all before going to Indonesia. Please tell us how could you mastered the language in a short period of time. Harugon: It has been a year passed after I transferred as a foreign student (transferred from AKB > JKT). At first, I didn’t understand the (Bahasa) words at all. But, rather than do the “practice makes perfect”, I experienced everything by being involved in the daily routine (with JKT’s members). And actually, I was very worried and nervous before being involved. But if I didn’t do that, I think I would have some things that I couldn’t understand. I tried to be involved and experienced everything, now I’ve gotten and studied a lot of new things. at first I couldn’t understand the vocabulary and the culture, but if I meet a lot of people, I can ask them to ask all about those and be used to them. I was so like that at least. Minister: Pardon me for the misspell. You declared to quit AKB48 and devote yourself in SNH48. Even though AKB48 is quite popular now, please tell us why’d you choose to be active in Shanghai. Sae: I’m 2nd generation in AKB48 but I can feel that I’m also the 1st generation who started-up and that’s very important thing to me as I through AKB48. It’s fantastic to start and advance to a new thing. So I planned to do a challenge in my life even once. I was willingly to try anyway. Minister: Did you remember the Chinese Language already? Sae: Not so fluent but yes. Minister: Try to speak in Chinese. Thanks for reading! Sorry for my poor English.